InvoTech Systems Inc. announced the recent implementation of its Uniform System at the new Waldorf Astoria Beverly Hills that opened June 1. InvoTech Systems is the leading provider of advanced Linen Management, Laundry and Uniform Systems that integrate the latest RFID technology to increase profitability for hotels, resorts, casino operators, sports arenas, convention centers and theme parks. 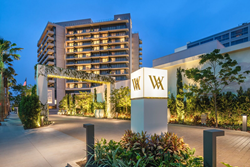 The InvoTech System installed at Waldorf Astoria Beverly Hills manages the uniform inventory for 400 employees, and joins InvoTech System’s extensive client portfolio of Hotels & Resorts worldwide. InvoTech's Uniform System establishes a perpetual uniform inventory and has extensive reporting capabilities to determine and forecast appropriate uniform purchases. The system provides significant cost saving benefits by cutting labor costs, eliminating losses, reducing purchases, and lowering laundry expenses. The uniform cleaning costs are entered into the InvoTech System and reports are provided to audit laundry expenses. “The InvoTech system is reliable, easy to use, and establishes an organized system for managing the uniforms. The system maintains our employee uniform assignments and tracks uniforms to and from the laundry giving us complete control and accountability of our inventory,” said Jeroen Werdmolder, Hotel Manager at Waldorf Astoria Beverly Hills. The system includes an electronic signature capture terminal that records each employee's signature when uniforms are assigned. This increases accountability for the uniform department and facilitates a paperless “green” system. “By installing the InvoTech Uniform System prior to the hotel grand opening, the Waldorf Astoria Beverly Hills can ensure that its uniform assets and PAR levels are properly assigned to each employee and the entire uniform inventory is tracked from day one” said Oswald Lares, Director of Sales at InvoTech Systems, Inc.